You’re probably all on to my little secret: I think caramelized onions improve almost anything. I first discovered them at age twelve (on a pizza at Bertucci’s, if you’re wondering) and I have since added them to all kinds of things (including mashed potatoes). 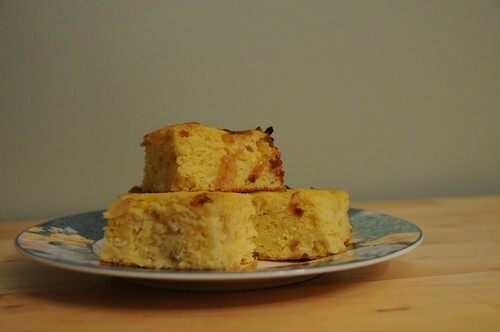 This recipe, which adds them to cornbread, is pretty much a stroke of genius. The secret ingredient in this recipe is goat cheese, which plays the part of butter with an added tang. (Not that there’s any shortage of actual butter to go with it. I wouldn’t do that to you.) The goat cheese flavor doesn’t come through strongly, but it provides a nice balance to the sweetness of the corn kernels and onions. When you’re ready to bake, peel and dice the onions, then heat 2 tablespoons of the butter in a heavy-bottomed skillet over medium-low heat. Add the onions and a pinch of salt and cook slowly. You want to still hear some sizzling and popping, but keep the heat just above where it stops. Stir them occasionally so they cook evenly, and keep cooking until they turn a lovely deep caramel brown. This will take at somewhere between fifteen and thirty minutes, depending on how impatient you are low you keep the heat. Set aside. In a big bowl, beat the goat cheese like you would butter, creaming it until it’s fluffy. (A stand or electric mixer can be a help here, but you can also totally do it with elbow grease.) Add the eggs one at a time (really, this helps!) and mix to combine. Do not fret if it looks curdled; everything will be fine! Melt another 2 T. of butter in the microwave or a saucepan. Add it to the mix, along with the sugar and honey. Then stir in the cornmeal/buttermilk mixture. Mix well. To the batter, add the flour, baking powder, and baking soda, along with another pinch of salt. 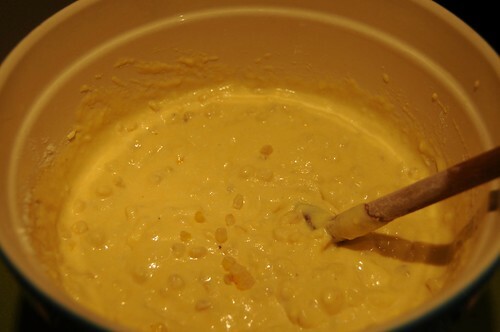 Stir to combine, then gently stir in the corn kernels. By now, your pan should have spent five minutes or so in the oven. Take it out — very carefully — and tilt it to spread the butter around. 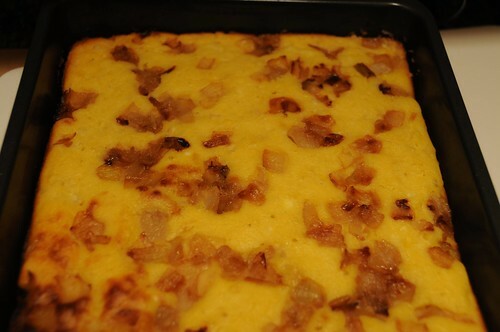 Pour the batter in, let it spread, and then sprinkle the caramelized onions on top. Bake for about 30 minutes, until a toothpick comes out clean. Allow the bread to cool for ten or fifteen minutes before slicing it. This bread also freezes well (cut into pieces and stored in freezer bags); reheat it wrapped in tinfoil in a 200 degree oven. *Ideally, what you want here is coarse or stone-ground cornmeal. You can sometimes find this in with natural foods in fancy brands (or as dry polenta); there’s also a version made by Goya that’s often in the international food aisle. **Worth buying, but if you don’t have it, you can make a substitute by putting 2 tablespoons of white vinegar in a liquid measuring cup and adding milk until it reaches the 2-cup mark and then waiting a few minutes for it to curdle.